Every good Pointless project begins with a kernel of curiosity. 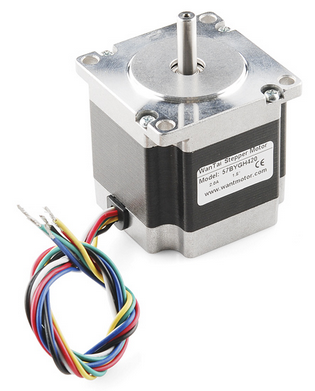 We've been curious about stepper motors and have been looking for a project that would let us experiment with them. Stepper motors are the brushless electric motors typically used in hardware applications that require a high degree of rotational control. 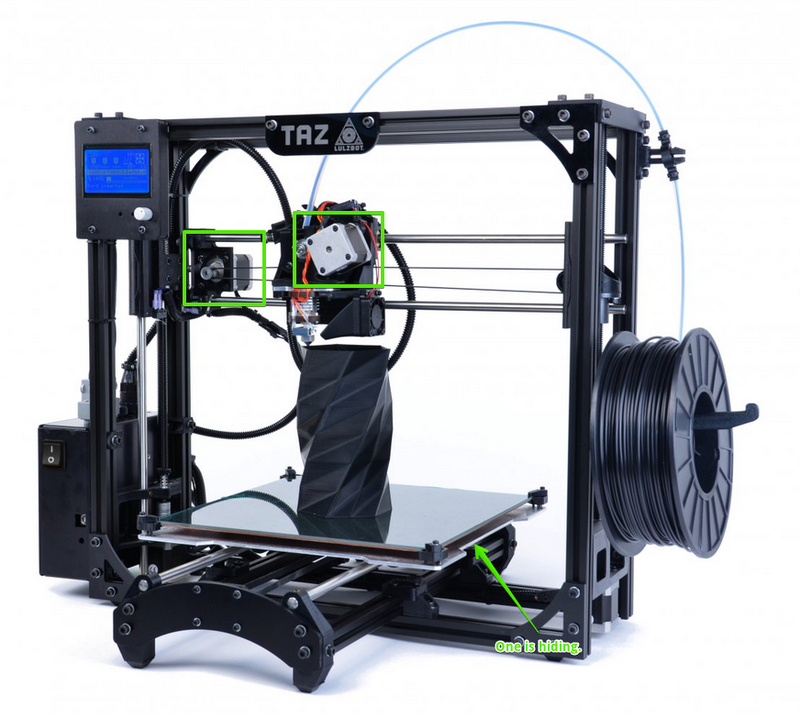 If you own a 3D printer, it’s very likely that the linear motions of the machine are driven by stepper motors. We were inspired by Laura's mantra and decided our foray into stepper motors would benefit dirty office whiteboards. Laura (Viget UX Designer) makes her position known. 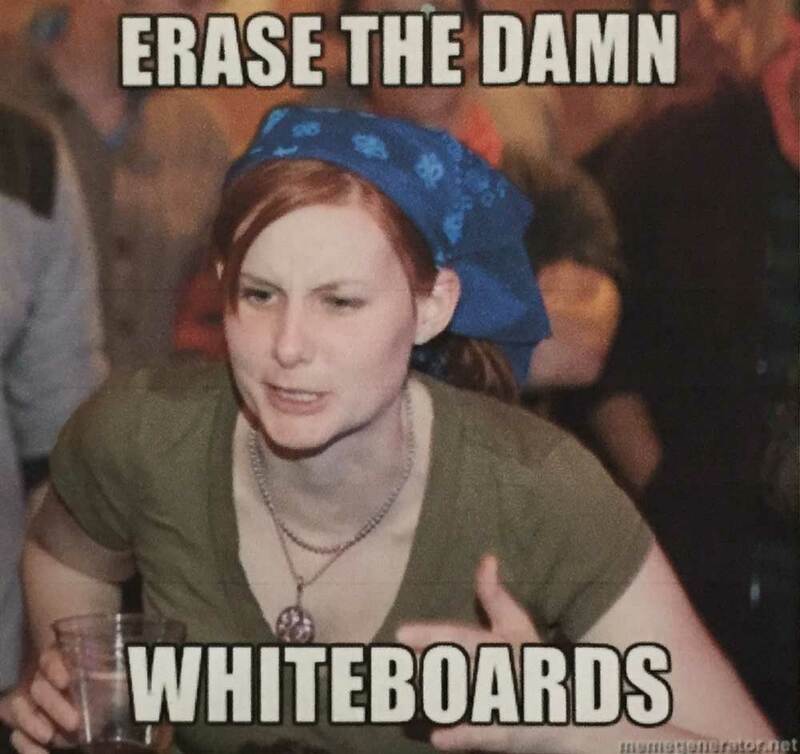 This week, we set out to design and build a bot to take care of the simple cleaning task everyone in the office has failed at: cleaning the whiteboards. Make no mistake -- this is something of a problem at Viget. One of our conference rooms has remnants of Pointless Weekend doodles from late November. It’s February, friends! The rough idea is to suspend a cleaning pad from two points and control it so that it moves across every inch of a whiteboard. We’ll use stepper motors for the puppeteer part of the design and a beefy brushless RC airplane motor to spin both the cleaning pad, as well as a propeller, so it pushes against a whiteboard. This all sounds well and good; but, could it actually clean a whiteboard? First order of business: validate the idea. We dove right in with a prototype. Using available spare parts, we hacked together a cleaning pad that spins and pushes itself against a whiteboard. 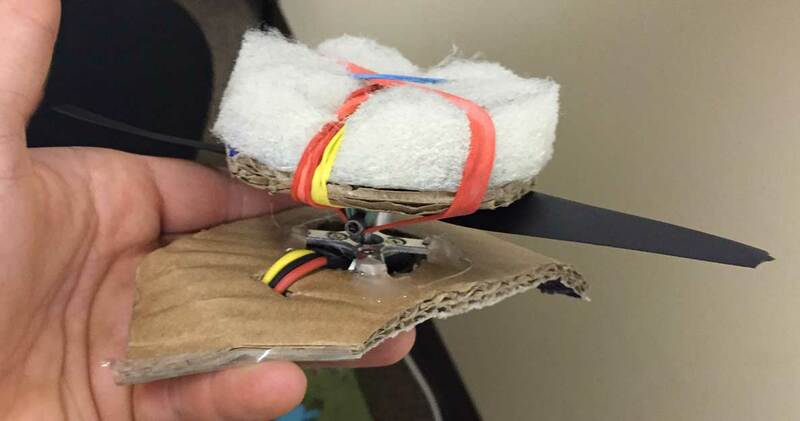 That’s a brushless motor, attached to an RC propeller, attached to a foam scrub pad. We built a prototype to quickly determine what level of cleanliness could be achieved by rotating a cleaning pad against a whiteboard. Something quickly became apparent: without the use of a solvent, our prototype could match the same level of cleanliness someone with years of experience and a hand eraser could produce. In this first pass, we weren’t concerned with perfection. We build things iteratively and this was good enough. There are two mechanical aspects to this project. The first is the business end of the device -- the spinning pad that pushes itself against the whiteboard. The other is the suspension system which controls and moves the pad across the whiteboard. Let’s talk about the math and motors involved with getting this right. 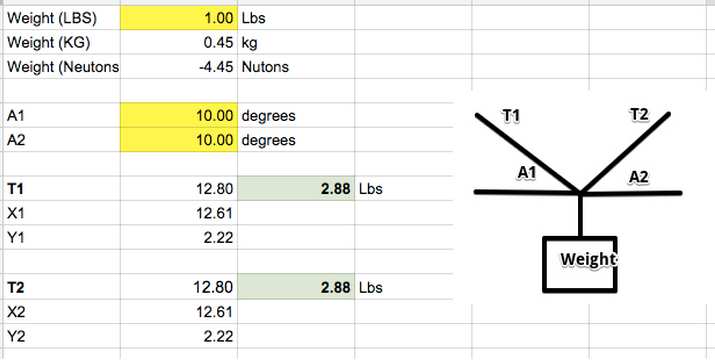 We began by creating a spreadsheet to model and calculate the forces acting on the suspension lines (T1 and T2). These important forces can be calculated by knowing three variables: the suspended weight and the position of that weight relative to the two points from which it is suspended (represented by two angles - A1 and A2). Notice the stepper motors located in the upper corners and the cleaning device located in the middle. We'll actually position the motors above the whiteboard. A1 is represented by the green lines. In this calculation, we modeled the worst-case scenario. 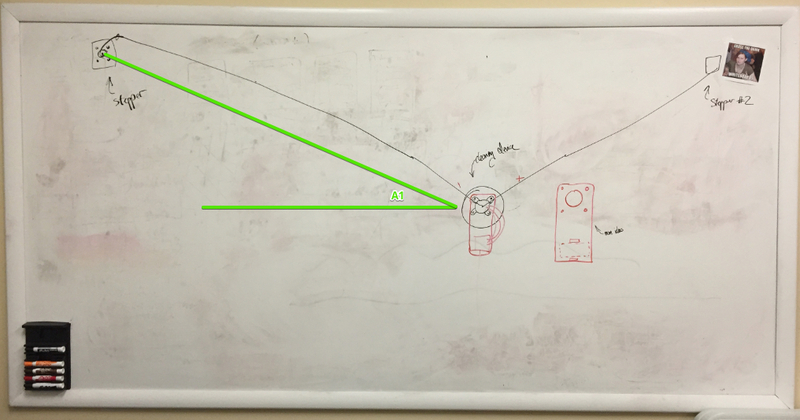 Imagine a 1 lb object at rest at its highest vertical position in the middle of the whiteboard. We conservatively estimated that this would be roughly 10 degrees off the horizontal. This means that each stepper motor would endure about 3 lbs of force. To inform our stepper motor selection, we began by determining the forces acting on each stepper. Our Boulder neighbors over at SparkFun have a number of steppers. They come in a variety of form factors and amounts of torque. For this application, we needed something with at least 3 lbs/inch of torque. We found a stepper with 125 oz/in (or 7.8 lbs/in) of torque. While this is more than double what we were looking for, we didn’t mind the extra torque cushion. It gives us the ability to push through unexpected engineering issues, which always come up. In a future post, I'll share more about the CAD design we’ve been thinking about and how we rely on rapid prototyping to bring project ideas to life. I'll also share some thoughts on 3D printing and what you need to know to avoid common pitfalls. Have your own vision for what a whiteboard cleaning bot could look like? Share them in the comments below. Sketches are welcome.